There are a couple of other things also available at the grove! What do we do with all the loose needles created from tying so many wreaths? We bag them up in little sachets! $3 per, these are delicious if stuck on your car dashboard so the heater warms them up and releases the balsam essential oil. 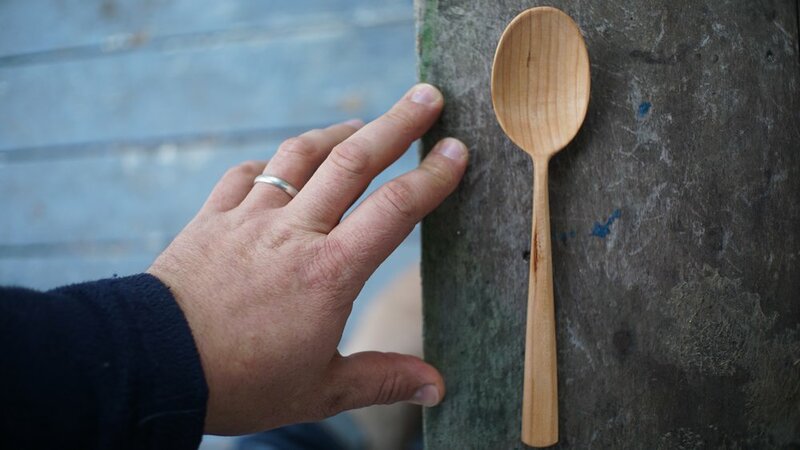 I try to have a selection of wooden spoons available at the grove as well, whether smaller table spoons like this one or larger cooking spoons. I carve spoons professionally the rest of the year (you can learn more about this at my main website, emmetvandriesche.com) and these can always be ordered at any time. There is also a separate wholesale list for these, so if you are a business interested in carrying my work, please be in touch. Aside from the work I have available at the grove for immediate purchase, I generally run about a two-month waiting list. So if you are hoping to place an order and wait until the holidays to do so, it will be too late. My books for wholesale orders for these closes at the end of August, so plan ahead.